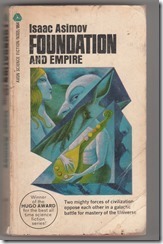 Foundation and Empire is the second book in Isaac Asimov's classic Foundation Trilogy, advancing the story of The Foundation - the civilization founded by Psychohistorian Hari Seldon in order to mitigate the collapse of the galactic empire and shorten the thousands of years of anarchy he foresaw following. The book is divided into 2 stories: "The General" and "The Mule". Story 1 is interesting but unremarkable. "The General" details a power struggle between the galactic emperor and Bel Riose - one of his generals. It is hundreds of years after Seldon's death and the empire has all but collapsed, as he predicted. Riose believes he can thwart Seldon's plan by attacking the Foundation. But he is only one man and Seldon's plan relies on the collective actions of the quintillions of people in the galaxy being more influential than anything that one man can accomplish. In the context of history, it does not matter what individuals do. The universe will move forward regardless. This is a basic assumption of psychohistory. However, the that assumption falls apart in the second half of the book. In the second story, we are introduced to The Mule, a powerful mutant born with the ability to control minds. His powers are so strong that he can affect galactic history by himself. This disrupts Seldon's master plan and allows The Mule to begin conquering the galaxy for himself. The Foundation falls to The Mule; but, when the Mule learns that Seldon established a Second Foundation at the other end of the galaxy, he sets out to find and destroy it. Meanwhile, Foundation loyalists also seek the location of the Second Foundation, so they can warn it about the Mule. I like how the two stories conflicted with one another. On the surface, they are only slightly related and separated by hundreds of years, but they show both the strength and weakness of math, science, and statistics. The first demonstrates how meaningless a single person, no matter how powerful or how ambitious, can affect a galaxy with quadrillions of people. The second shows exactly the opposite. The Mule's power is strong enough that he disrupts Seldon's entire plan. Further, The Mule's plans are thwarted by a single person. It is this contradiction that makes Asimov's story so compelling. He takes us in one direction and makes us feel comfortable; then destroys all our assumptions.